James Bond-actor Pierce Brosnan could be a stealthy British agent who senses trouble like a clairvoyant on cinemas, but in real life, he is as gullible as any other person. The American actor told Indian authorities recently that he was taken for a ride by a pan masala company based in the country that promoted an alleged tobacco laden product with Brosnan as the face of the brand. 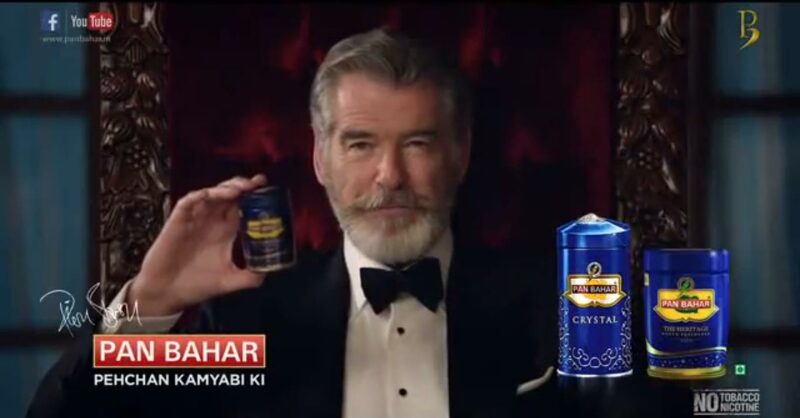 According to a written statement given by Brosnan, a brand named ‘Pan Bahar’ approached him under the pretext that it is a mouth freshener. Brosnan said Ashok & Co., the Indian company that owns the brand ‘Pan Bhar,’ intentionally did not reveal the hazardous nature of the product. Brosnan had to provide his statement to the Indian authorities as the country prohibits advertisements of tobacco products through both print and visual advertisements. “We are the oldest brand of mouth freshener in India and we don’t produce either gutka or pan masala. But after the 1990s when gutka flooded the market, all mouth freshener products also got a bad name,” a spokesman for the company said in 2016. He also added that roping Brosnan for the advertisement was part of the company’s mission to try and change the perception of the people about its product. In television advertisements that played for a brief while on Indian media, the Hollywood actor can be seen forgetting his Walther pistol on a very dangerous mission. Now, the only weapon that beholds Bond is a pan masala tin, which moves by itself and beats opponents, almost like a possessed matter. The brand wanted to prove that their small tin of pan masala is enough to fight bloodthirsty criminals, fully equipped with latest guns – an idea that seems to have been inspired by some spoof movie. According to Delhi Health official S K Arora, the written statement provided by Brosnan assured the government that he has withdrawn the agreement with the company and no such campaigns will be done in the future.